Just outside the city limits of Charlottesville, Virginia but still in the urban ring of the city lies a six and one half acre parcel of land that developers have overlooked in the current market. Its gentle south-facing slope, access to trail networks, and its existing structures make it the perfect place for something a bit different from a typical subdivision. The property has been purchased and has already become a community center by hosting community events of all sorts from Transition Town meetings to music and cultural gatherings. The vision for the property has evolved over several years through the dedicated work of an excited group of people. Vision: We see compassion, kindness, cooperation, open communication, justice and mutual trust as central to healthy living. As a community laboratory/classroom, we experiment, fail, succeed, learn and teach ourselves and others how to work, play and grow together in harmony with nature. We welcome and celebrate both our shared vision and our individual and familial differences in ethnicity, age, abilities, economic means, spiritual beliefs, gender preferences, as well as differences in our need for privacy and personal choice about participating in making decisions for our community. We strive to recognize each other’s needs and wants, to help each other as best we can to meet them, and to forgive ourselves and each other when we fail to do so. We strive to embrace and cultivate the wisdom of elders, the strength of young adulthood, the exuberance of youth, and the innocent joys of young children and babies. We will design and build structures that are attractive and inviting, sustainable, artistic and integrated into the natural environment. And we will create together a model of how diverse groups of people can share ideas, resources and the joys of living in tune with nature. Identifying critical ecological problems, finding solutions and implementing them in our EcoVillage, demonstrating effective solutions we find, and widely disseminating information about those solutions. 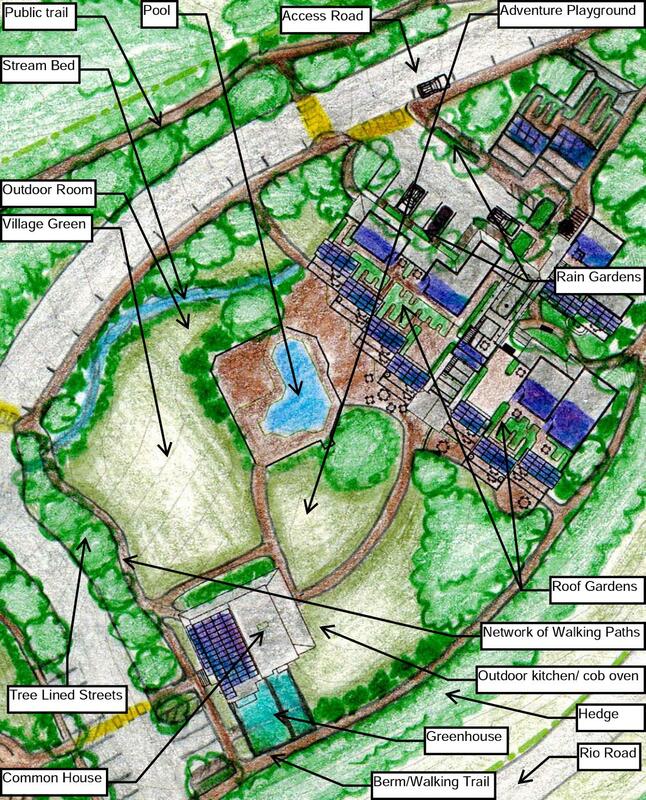 My story: Several years ago I attended a “greater stonehenge ecovillage” meeting in the foothills surrounding Charlottesville Virginia and volunteered my time as an engineer and 3D modeler to use my talents at the time to help make the project a reality. Little did I realize that I would become deeply involved in the founders group which then became the ecovillage board of directors. In this process I have re-educated myself into the fields of urban planning, pattern languages, architecture, landscape design, and permaculture. My reason for spending so much time to help this community’s formation is to be part of the solution by building a local hub of healthy, sustainable living in order to teach the greater community about better ways to live with those around them and with nature. 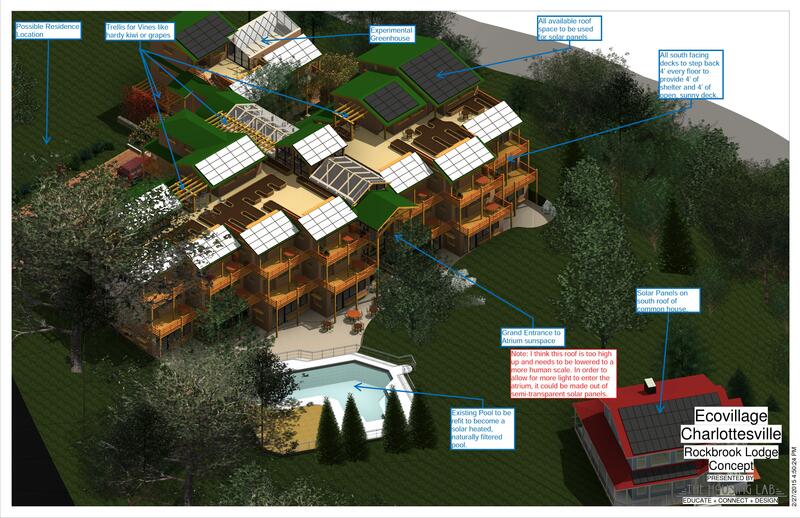 The following work shown in this write-up is of my own generation unless referenced, none of it would be possible without the ideas, feedback and visions of many people involved in the Ecovillage Charlottesville Project as well as architecture and permaculture visionaries who have shared their insights with the world. Fred Oesch (http://fredoesch.com/) has been my closest collaborator in the design process since I began working on the project years ago, whose ideas and drawings have provided me with guidance and criticism. All things written in blue are my commentary on the design process, permaculture principles, and things I would have done differently. 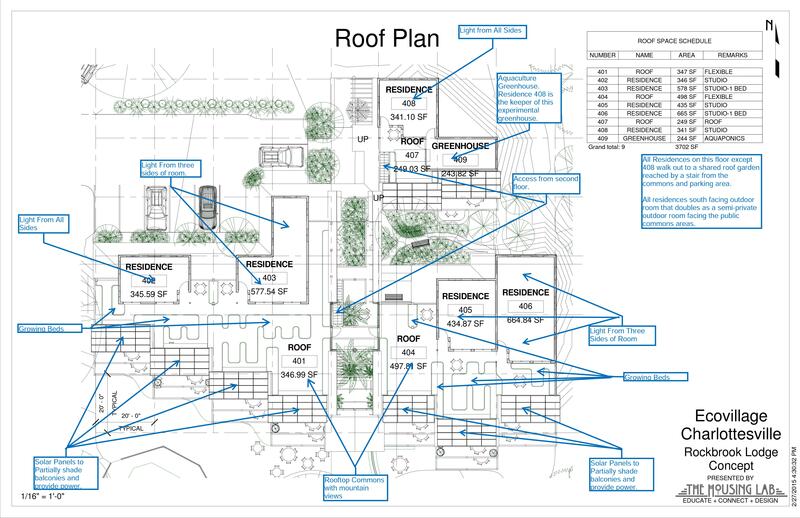 The Housing Lab (thehousinglab.org), which is the logo on some of the drawings, is a website I started several years ago which has been my attempt to share what I (and a community of others) have learned with others about more sustainable ways of making a home. Community Patterns: The ethics of Earth Care, People Care, and Fair Share are at the heart of the community vision and this design is an attempt to make all of these a reality. 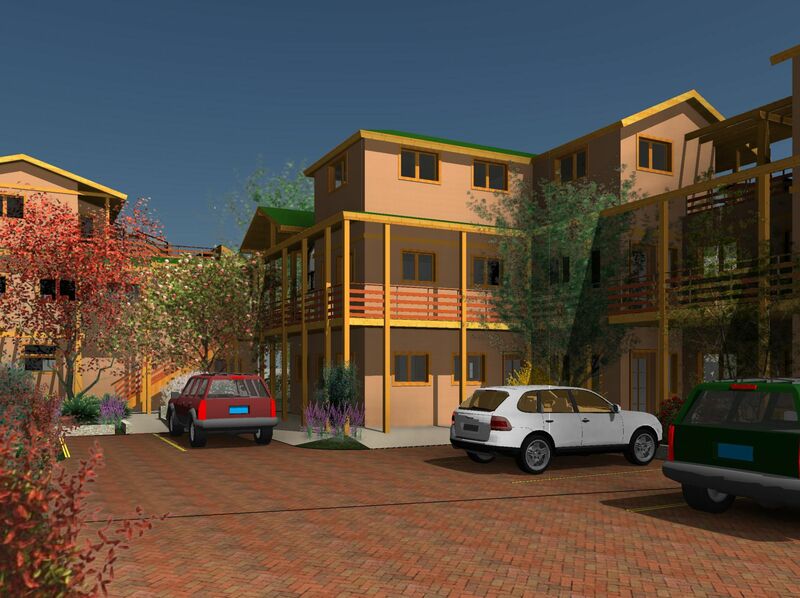 There will be a residential component, which is to include housing for all the stages of life from infants to elders. In order for this to happen, the dwellings must be financially and physically accessible to a much larger group of people than usual in the Charlottesville housing market. Somehow, ownership needs to be instilled in the community members or else the whole concept will fall apart. Along with this residential component there will be shared spaces and shared utilities such as guest rooms, meeting spaces, playground, gardens, greenhouse, orchards, shared vehicles, dining room, laundry as well as day care. A Cooperative Zero-Waste Grocery Store can provide the basic necessities of sustenance for the residents of the community as well as local neighborhoods within walking distance which will cut down on car trips and encourage the useful walk. All food would be locally sourced. A cooperative model will not stratify wealth. 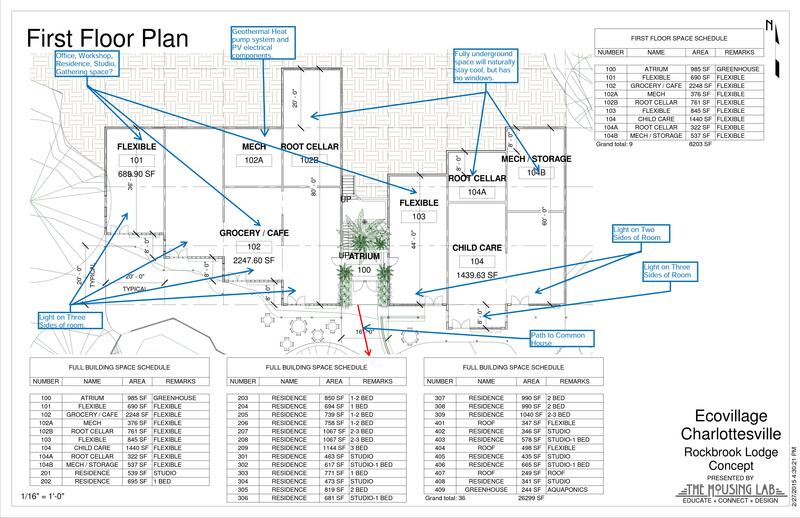 After giving this a lot of thought, I am beginning to question the financial feasibility (and zoning possibility) of a grocery store on the ecovillage property. Perhaps a simpler, more attainable idea is to partner with a local CSA like “Horse and Buggy Produce”, “Local Food Hub”, or “Relay Foods” to bring fresh, local food weekly to the community and have a small storeroom or small convenience type store. Child care is essential for an age where both parents work, but is also essential to bring back the feeling of the extended multigenerational family which has also been lost since the dawn of the personal automobile. If it is run by parents, young people and elders in the community it will provide meaningful work and community cohesion as well as bringing the cost down to a reasonable level. 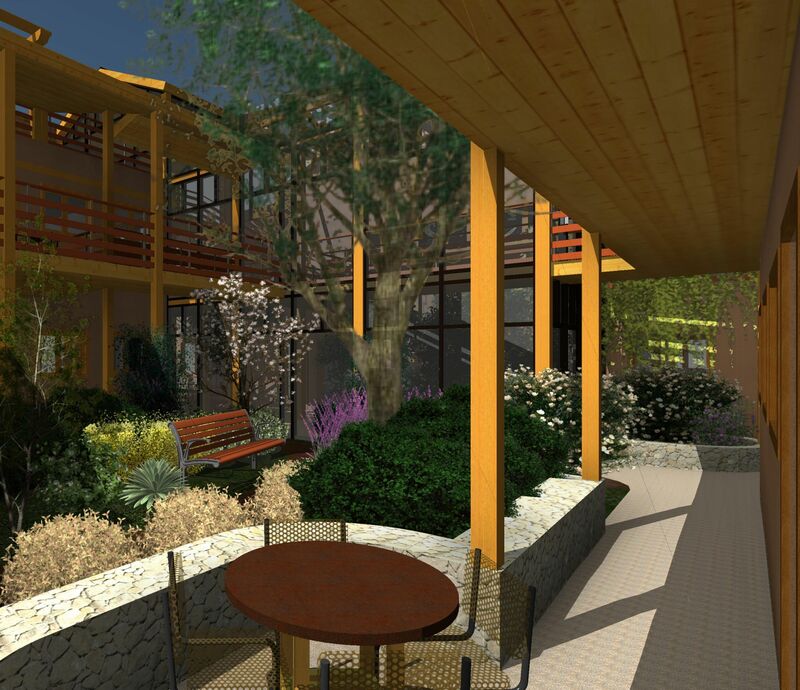 The University marketplace is still in its infant planning stages, but we hope to collaborate with the local educational centers (University of Virginia, The Charlottesville Technical Education Center, Piedmont Virginia Community College and others) by providing lecture space, field research space and project space for students and perhaps a dorm like cooperative housing option to give students a first hand experience in an ecological community. The largest problem with the site is vehicle access because its shape is largely dictated by the Virginia Department of Transportation. After investigating many different designs for different locations on the site, the most feasible option is to repair the existing northern road’s entrance onto the state road and then extend a cul-de-sac into the community for the required fire truck access. Roughly half of the site is covered by urban forest of varying quality. half of it to the south-west is older and somewhat mature, but is overgrown with vines and bamboo. The half to the north is not very healthy or mature, some healthy trees can be saved, but it is a prime place for an orchard. First the dwellings, common space, roads, and other hardscapes have to be located on the site. The constraints on these features are very much impacted by the shape of the site, the road access point, and the existing structures. 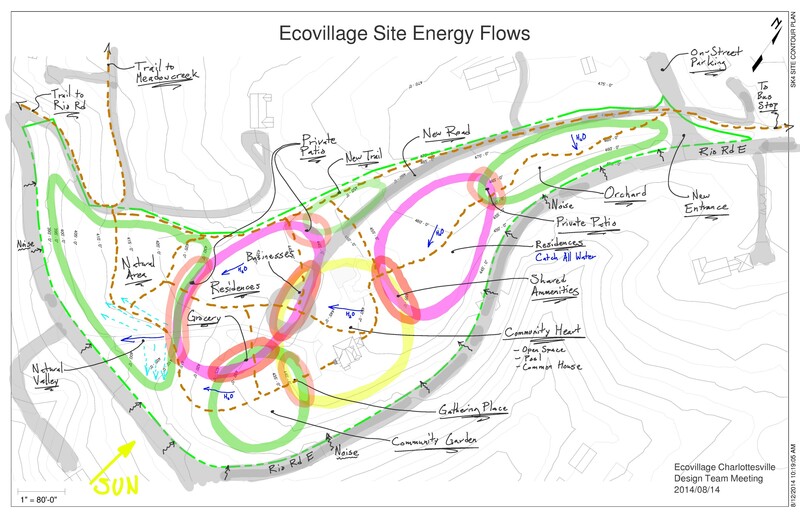 To incorporate the energy flows into these decisions, a energy sector map was drawn after many trips to the site in different weather conditions (Observe and Interact). The most notable energy flow is water; it flows very rapidly on this site because the whole site is sloped in several directions. Several rough zone maps were then built to better understand how people might interact between the common areas and the residential areas, showing forest, garden, residence and common areas: here are a few of the maps that attempt to pin down the different areas of the site. The roads, buildings and trails are designed. The road is the trickiest part of the design, because several factors are involved beyond our control. Getting permits are dependent on approval from the department of transportation, which leads us to the only viable solution for an entrance at the north end of the site. The minimum pavement width in our county is 20 feet for two way traffic, with cars only being 6 feet wide, 10 feet lanes are wasteful and encourage speeding. Increasing the road width to 24 feet allows for parallel parking on one side and two lanes of traffic. This is a much more multi-functional use of the required pavement and will satisfy a large amount of the parking spots required by the county. This will reduce speeding because of the narrower (8 foot) lanes and the parked cars will act as a shelter for people on the other side of them which will then feel safer. Since only one entrance is feasible, a turnaround will be required. Parking at the common house will be needed for accessibility. 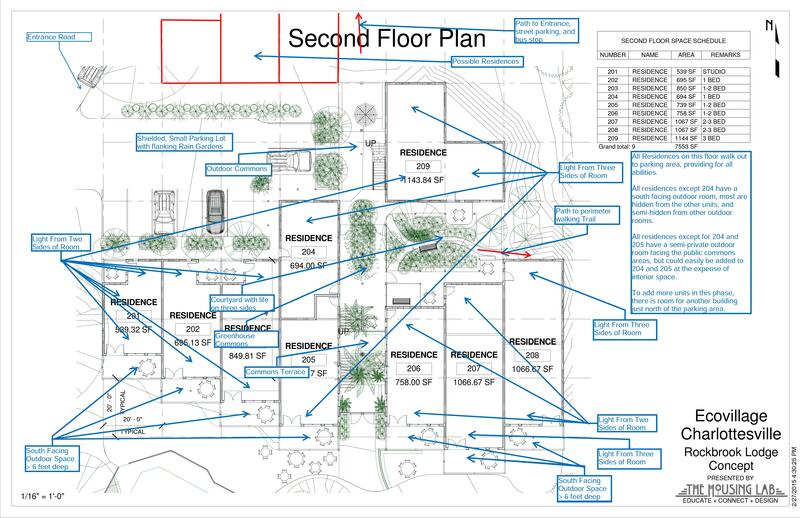 The fire department requires that all residences be within 100 feet of the nearest pavement, this affects a large portion of the site design. 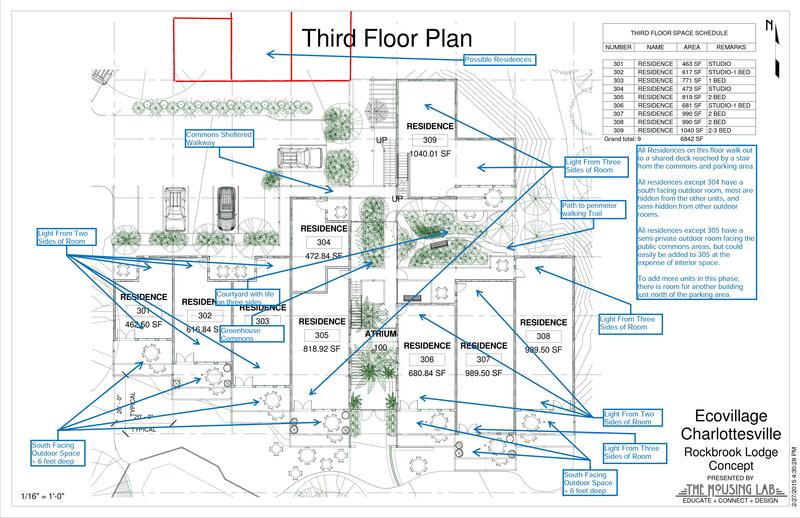 The ethic of People Care takes front and center during the building stage of the design process, and to do this effectively, I have called on A Pattern Language(1) as the main reference in making the site plan and the dwellings “feel” right. The buildings have been designed from Pattern to Details; in fact a great number of details have not been designed at this point such as the interior floor plans. Catching and Storing energy will be accomplished by the buildings using photovoltaic solar panels for electricity, slowing and storing of water using roof gardens and water storage, solar hot water, and passive solar design. 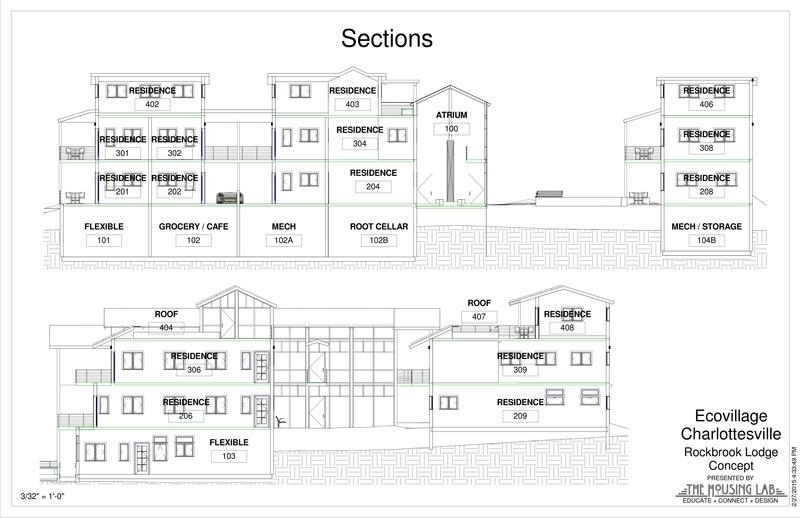 Self-Regulation has been applied to the building design in the selection of materials and the reduction in the size of the footprint. The following images are representative of the main building. My Thoughts: As an architectural engineer, the pattern based approach to designing this building from the large patterns to the details was different from my daily routines. It is a very enlightening and exciting way of designing. I read A Pattern Language after watching all of the permaculture lectures and it has completely changed the way I design a building or a site. I am now focused on making spaces that “feel” right; The ultimate test of any building is if the residents love living there. After further refinement of the zone maps and better resolution on the exact dimensions of the buildings, trails and roads, a final zone map is generated. This map attempts to show which areas of the site will get the most attention but is tricky because there are so many people inhabiting the site. 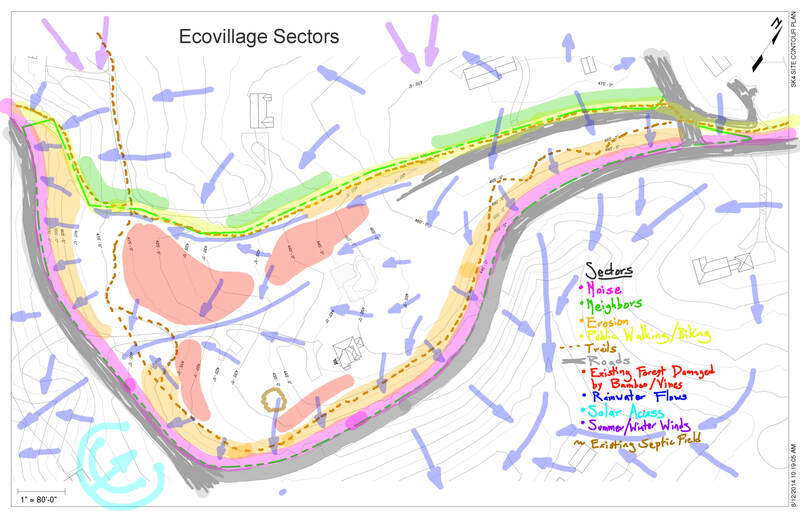 The final site plan is then generated using the governing patterns listed above and in this graphic. Northern area: The area north of the first phase of buildings is a very skinny area that will be the most disturbed area of the site. It is also an important point of entrance as long as cars are the primary mode of transportation. Gateway: This area serves as the gateway to the community by vehicle or by foot from the nearest bus stop. This creates a unique pattern of movement on the site where many people will walk past it quite regularly during the day. 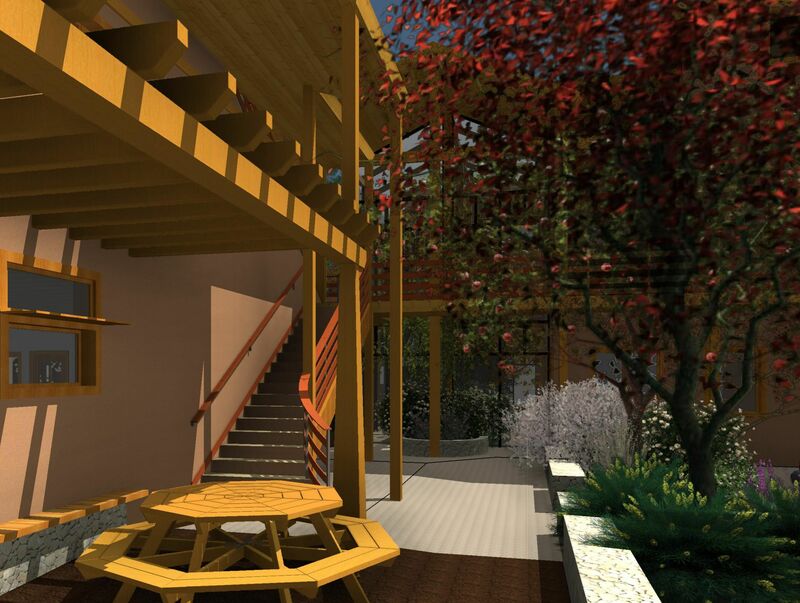 The aesthetic should appeal to a lot of people as it is the beginning of the ecovillage showcase. Some sort of entrance that embodies the feeling of the community is needed as a threshold, something like a large arbor or a low cob wall with a gazebo built into it might have the right effect. Water Management: This area slopes heavily from the access road down to rio road, so capturing the rainwater is a big part of this small strip (Use Edges and Value the Marginal). 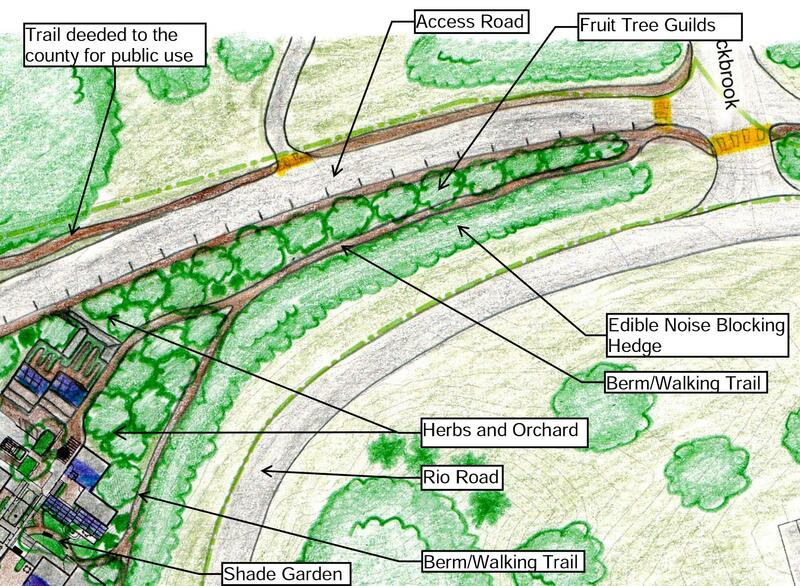 The Walking trail in the middle is a great place to use fill dirt from excavation to create a raised walkway berm that will slow & sink the water (Catch and Store Energy) heading down the hill as well as providing easy access to the fruit tree guilds (https://midwestpermaculture.com/2013/04/plant-guilds)(2) (Obtain a Yield) (containing a large number of soil building plants) and edible noise blocking hedge (with many pollution tolerant and semi-evergreen species). As the site widens and gets closer to the buildings, it also flattens out a bit. The Bermed walking trail and edible noise blocking hedge continues around the entire site. More intensive gardening can occur in this area as it is a few feet from residences, so dwarf fruit trees and herbs can be grown in this area along with edible plants that require more care. Central area: This area contains the largest residence and the common house and is the heart of activity on the site. Between the new building and the common house is an area that is already open and an obvious choice for a common greenspace for play and gathering, a playground, existing pool, and an outdoor kitchen with cob oven. All of the margins of this space will have garden beds with herbs and vegetables (Integrate Rather Than Segregate). 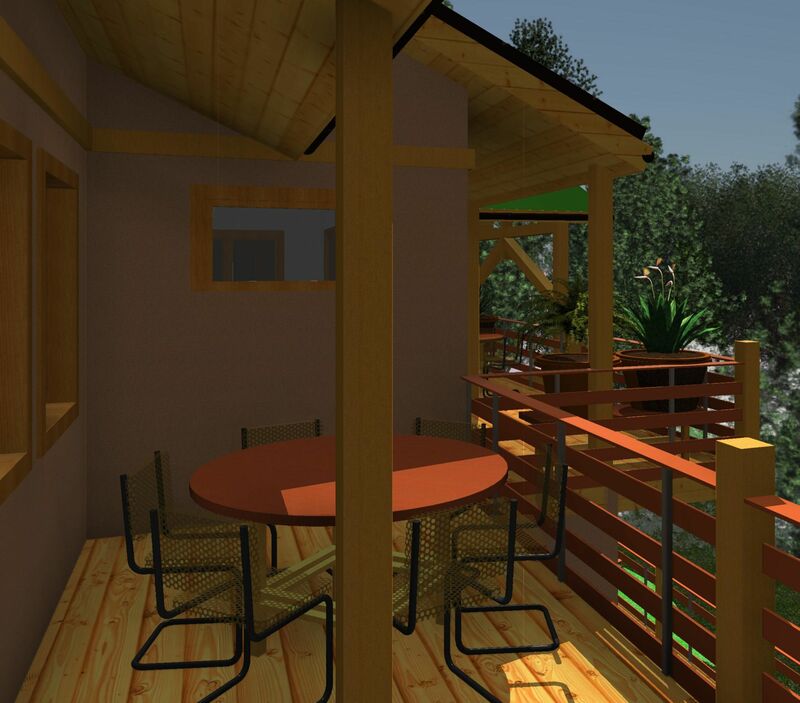 Outdoor living spaces are to be incorporated into the nooks of the site on the edges of the open community areas where people can rest, garden, or observe community life. Tree lined streets with a intentionally thick shrub layer will increase safely, but may end up being mostly non-edible habitat and filtering species like sycamores and oaks because they will be receiving questionable roadway runoff (At least until we stop using fossil fuel vehicles). 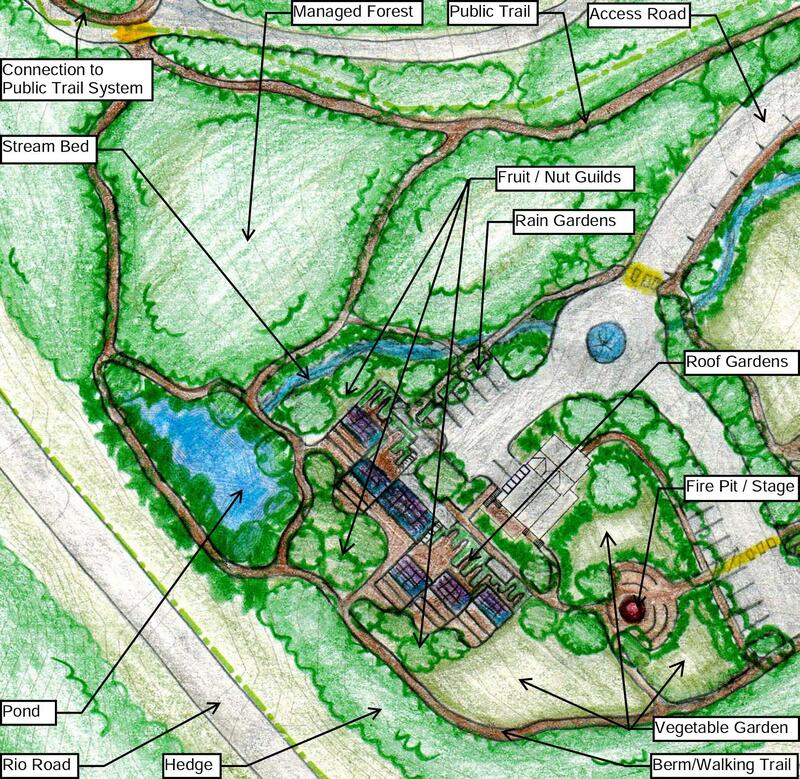 All parking areas will remain small and have native rain gardens surrounding them (http://www.lowimpactdevelopment.org/raingarden_design/templates.htm)(5). Roads will be de-emphasized by using traffic calming chokers and on-street parking, and all intersections will be T intersections. Southern Area: This area contains many of the same patterns as the central area and it will also have many community amenities. Rain gardens around the small parking areas. Fire pit and stage area will provide an outdoor gathering space for the immediate community and for the surrounding charlottesville community. The existing forest will be managed and maintained by the community and used as a forest garden, filling the niches vacated by the rampant bamboo with useful organisms . The first phase of the project has already begun. That is that the interpersonal community is being put together. This is probably the hardest part of the entire project and will continue as long as the community exists. The second phase is also underway: the cleanup of the existing property. Chickens and goats groom the property, vegetable gardens terrace the slopes, and energy improvements to the existing common house have been started. The third phase and most pivotal financially is the infrastructure development. This is when the major earthwork will begin; starting with the entrance road, the pond, and the required sewer line out of the property. After the ground has been disturbed and the earthworks are all in place, the common area and areas that will be far enough from buildings can be planted, like the edible/noise blocking hedge around the property as well as shade/nut/orchard trees, groundcovers and soil building shrubs. Some of this can be started once a final design is agreed upon. 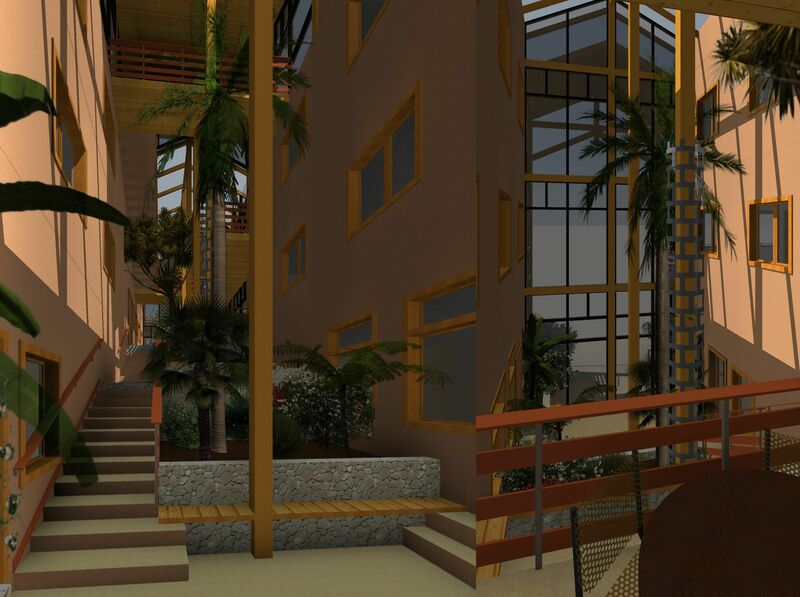 Once people move in the real landscaping can begin, starting at the residences and common spaces and gradually moving outward. Vegetable and Herb gardens planted. 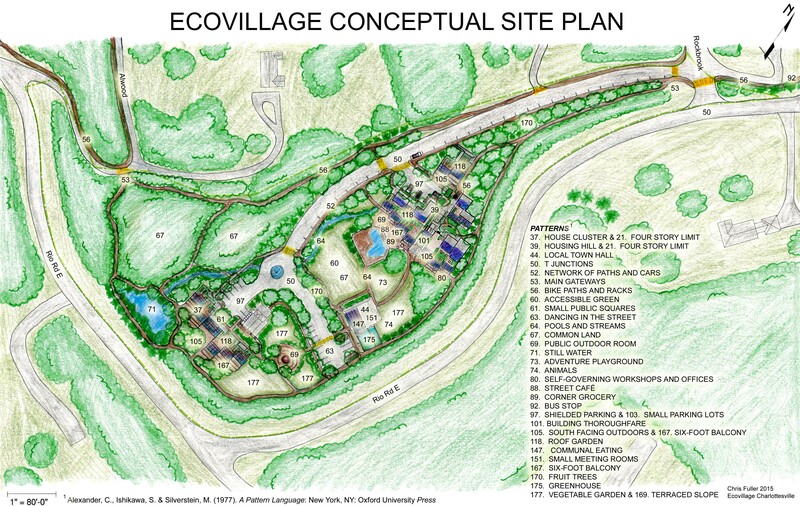 My Thoughts on the Future: The fully volunteer organization of the ecovillage is taking some time to get enough traction to start doing bigger things, but hopefully sometime soon there will be funding for the infrastructure needed to begin work. 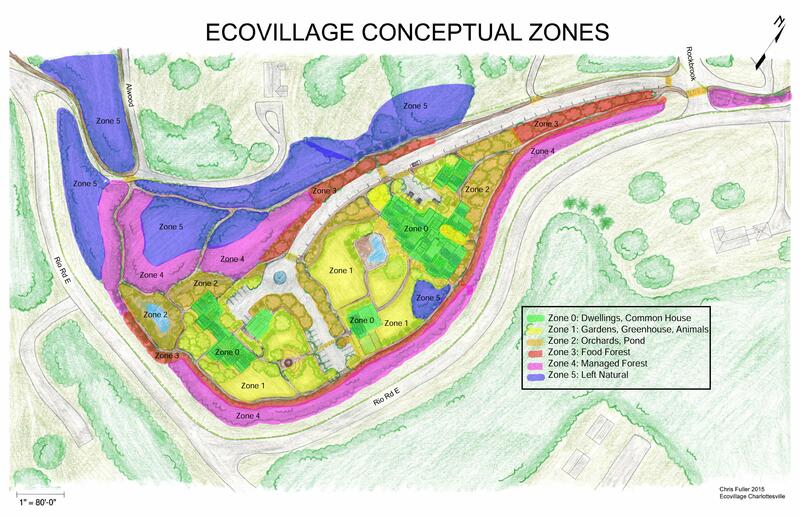 In the meantime, as can be seen on ecovillage charlottesville’s website, the community building has already begun. Once the infrastructure and buildings are approved by the board and the county, I would like to help design the full landscape design to incorporate guilds, outdoor rooms, soil building, and everything else that I learned in the permaculture course as well as the books I read as a companion to the course: A Pattern Language(1), Gaia’s Garden(6), Walkable City(7), and Edible Forest Gardens, Vol 2(8). As things are built and plants are planted, I can learn what things worked and didn’t so that I can apply the learning to the rest of the project and to my design palette (Accept Feedback).